Here's the sequel to Scott Robertson's earlier book How to Draw. 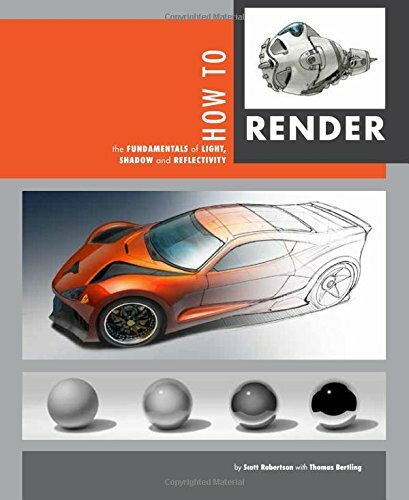 How to Render builds on what was taught in the earlier book and now talks about lighting, shadows, reflections and materials. Again, it's a book for artists, architects and designers. The difficulty level here is up one notch, more suitable for intermediate and advanced artists. Basically, you need to know how to draw before you can learn and apply the knowledge from this book. That's where the earlier book comes in. The presentation style of the book is still similar. Book's slightly thicker at 272 pages and is available in paperback and hardcover. There are lots of diagrams, photos, artworks accompanied by concise and insightful writeup. The information is technical and in depth. Demonstration videos are provided on the companion website which you can access by scanning QR code in the book or typing the URL address. The first half of the book covers light and shadow. This is where you learn the basics of lighting, and the rules of applying them. It starts off with the simple humble cube and progresses to complex overlapping geometric shapes, spheres and cylinders and then onto curved surfaces that you typically see in vehicles such as cars and planes. If you know the Sketchup software, then you might know about the beautiful shadows that can be turned on with just one mouse click. Well, with this book, you get to learn how to draw all those shadows by hand manually, and learn the actual techniques to creating them accurately. It's not easy, but the book does a good job at demystifying the whole process with clear hey-follow-along instructions. Still in the lighting section, there are some step-by-step demonstrations by guest artists Chris Ayers, Neville Page, John Park and Robh Ruppel on how to render specific objects like cars, characters and landscapes. Basically, it's to show how they apply the knowledge into actual drawings. This is where I have to do a -_- because the tutorial Robh Ruppel wrote is the one I was expecting to be in his Graphic L.A. artbook but it wasn't! The second half of the book goes into reflections, talking about the different lighting conditions and how they affect the different types surfaces and the look they create. This section is more explanation than hands-on — this is not a book on software or digital painting. Numerous photos are provided to illustrate the concepts behind, to alert you to things you should take note of. Very insightful. Scott Robertson has hit another home run with this wonderful technical book on light, shadows and reflections. It's an incredible resource for learners. By the way, I would also suggest getting James Gurney's book Color and Light which is another insightful book on lighting.